January 10, 2018 — QuirkLogic has unveiled an array of new features for Quilla, which it touts as the world’s first digital writing solution for real-time ideation. The company is a provider of productivity technology designed to help corporate teams “spark and grow big ideas” in industries such as design, architecture, construction, technology, healthcare and education. Quilla’s real-time ideation solution replicates the familiar feel of paper and pen. Combined with a supporting ecosystem that offers the power to share content, Quilla enables organizations to centrally capture, create, collaborate, share and iterate ideas in real time for business advantage, and allows participants to focus on the creative process rather than the technology, which just fades into the background. Quilla enables organizations to centrally capture, create, collaborate, share and iterate ideas in real time, and allows participants to focus on the creative process rather than the technology. With Quilla, users can walk up, grab a pen, and comfortably brainstorm ideas, actions, and plans without hitting setup hurdles, says the company. If they want to return to their work, they can pick up where they left off in an instant. With Quilla, teams are no longer bound to conference rooms that have equipment nailed to a wall or anchored by a wire, and instead can make better use of spaces designed for informal, ad-hoc interaction. Quilla is lightweight (24 lbs. ), with a rechargeable battery, making it equally easy to snap onto a wall mount or carry on the go, to allow for brainstorming in any location. Meanwhile, remote participants can collaborate with others in real time, through centralized library and workbook sharing, enabled by an intelligent connected ecosystem that does the heavy lifting behind the scenes, keeping it simple for the users. 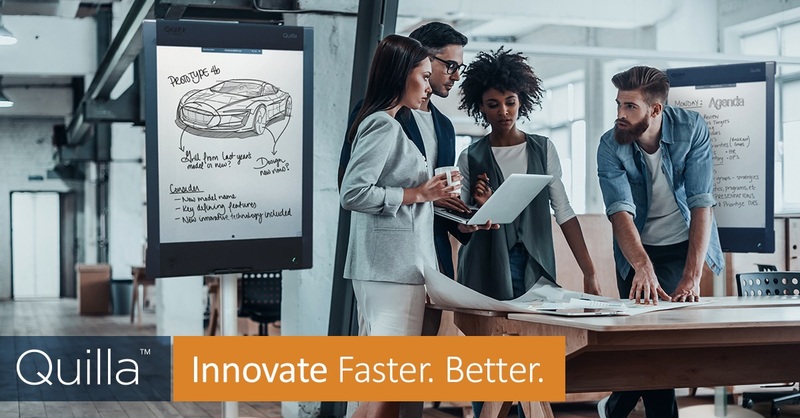 QuirkLogic says Quilla makes it easy to run efficient meetings, sketch out artwork, design products or processes, formulate plans, mark-up documents, and more. QuirkLogic has significantly improved Quilla’s content management features to help make meetings more productive. We have significantly improved Quilla’s content management features that ultimately help make meetings more productive. Quilla now includes a real-time ideation ecosystem that facilitates organizations to easily manage and share collective ideas in the same way they manage trade secrets and other valuable IP assets like strategic plans, financial spreadsheets, engineering designs, client presentations, and so forth. 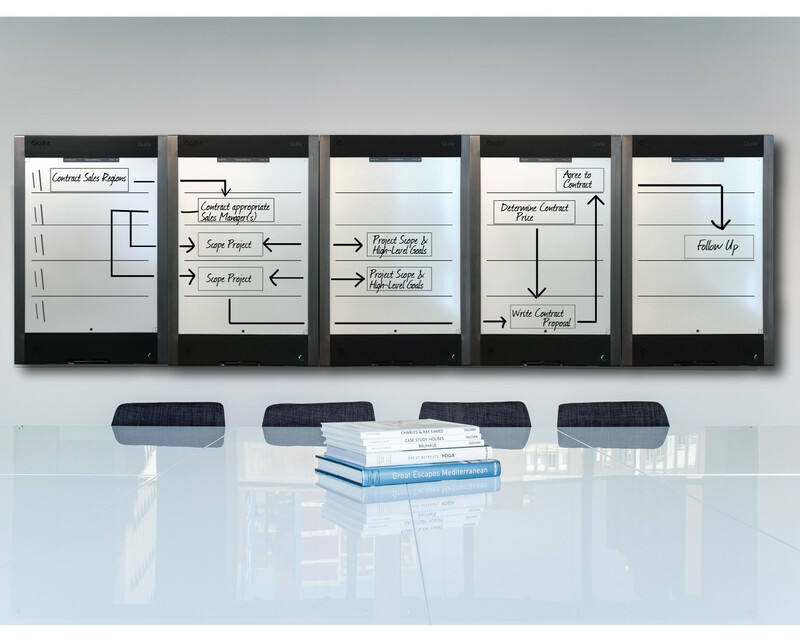 Instead of having these valuable intellectual assets walk out the door as photos of whiteboards on personal mobile devices, with our cloud-based platform all content is securely stored centrally, with user defined access so teams can easily find content and continue where they last left off. In fact, a recent IDG Research Services survey illustrated the need for more effective tools to facilitate brainstorming during meetings, as well as capturing, sharing, storing and accessing content afterwards, points out QuirkLogic. Lastly, a new authenticator app is being rolled out — this will allow users to conveniently sign in to all Quilla devices using Android or iOS mobile devices, notes the company. General availability for Release 1.1 of Quilla is planned for Q1 2018.